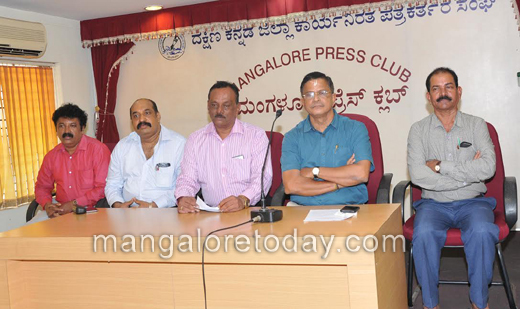 Mangaluru, Jun 29, 2017 : Addressing the media at press club Sitharam Shetty, former president of Vijaya Bank Workers Organisation said the MCC unilaterally decided to christen it as ’Mulky Sundararama Shetty Road’ in honour of the founder of Vijaya Bank. The naming ceremony will be held on July 02 at the premises of Vijaya Bank regional office . The issue of renaming the road was put forth before in 2010 anf the MCC has finally has approved it. The Government should give the move in regrd to this issue . The regional office of the bank too is located on the same stretch abutting Jyoti Circle. The organiasation had struggled much towards the welfare of the society. It was earlier called as Light House Hill Road, later named St Aloysius College Road, will be renamed as Mulky Sundararama Shetty Road. The oraginsation also requested the press to support them in this regard. The programme will be inagurted by District in-charge minister Ramanath Rai , Mayor of Mangaluru City Corporation Kavitha Sanil, Deputy commissioner Dr K G Jagadeesh, Police Commissioner R Suresh, Minister of Food and Civil Supplies U T Khader, Commissioner of Mangaluru City Corporation Mohammed Nazir, MP Nalin Kumar Kateel, MLAs Moideen Bava and J R Lobo, MLC Ivan D’Souza Chief whip of MCC , Mahabala Maarla, Dr N Vinaya Hegde, Dr Mohan Alva, A J Shetty, A Sadananda Shetty, Ajith Kumar Rai Maladi, Former Minister K Amarnath Shetty, Regional corporator Vinaya Raj and many other dignataries are invited to the inaugural function. Shridhar Shetty M, Bhaskar Malli, Raghuram Suvarna and others were present.